Update: While this review is still valid in many aspects, there are new features and changes to Wealthy Affiliate. Follow the link to read my most recent Wealthy Affiliate Review. As with most online reviews for products and services, I’ve noticed that a lot of the reviews of Wealthy Affiliate say that there isn’t any downside or cons to Wealthy Affiliate. One of the common downsides to Wealthy Affiliate I’ve heard mentioned is that “there is too much training and it can be overwhelming”. While that can be a legitimate concern I think most people see it as a thinly disguised attempt at providing a balanced review. With this review I want to bring up some of the shortcomings of Wealthy Affiliate that aren’t often mentioned. If you are a seasoned website owner and have owned websites in the past with different hosting companies this may be somewhat of a “pain in the you know where” type of thing. As a part of the premium membership level you are allowed to host unlimited websites using the Wealthy Affiliate hosting service. They’ve turned their hosting into a type of managed hosting and as part of this managed hosting they don’t give you Cpanel or Parallels Plesk control panel access. They do this to help make their hosting service more secure. You can read more about their decision to eliminate Plesk here. Since you don’t have Cpanel or Parallels Plesk access you are unable to access the MySQL databases to upload your database yourself should you want to transfer your WordPress website to Wealthy Affiliate’s hosting. In order to transfer your website you would have to submit a support ticket and have them import your database for you. You are able to upload and access your website files through FTP though. Wealthy Affiliate hosting does prevent some plugins from being installed and used. If you happen to use one of those plugins on a WordPress website that you already own and wanted to take advantage of the WA hosting included in your premium membership fee you would not be able to use those plugins once you transfer those plugins in. Wealthy Affiliate does this as a security and performance issue. They say that a lot of plugins are poorly coded and present security and performance issue. In order to maintain the integrity and performance of their hosting service they will ban some plugins. I’ve screen captured a comment where Carson explains why they ban certain plugins. If you want to see the entire discussion just click on the image or here. To be fair, Wealthy Affiliate isn’t the only hosting company that bans WordPress Plugins. I’ve seen other hosting companies take similar actions to maintain the quality of their hosting. This is another issue that I see new members asking about how to do it. If you buy a domain through a domain registrar and you point it to Wealthy Affiliate’s name servers, Wealthy Affiliate does let you set up an email account on their server. However, in order to access this email account you have to use webmail. Update: In recent years Wealthy Affiliate has updated their email system to enable you to be able to use email clients such as Outlook to send and receive domain email. I’ve tried to setup Outlook and have been completely unsuccessful. One member reportedly was able to setup her Outlook to receive incoming email, but was unable to send outgoing email. To send email she had to log into her associated webmail account and respond to the message from there. As a workaround to this, Wealthy Affiliate has a built in function that allows you to create an email forwarder so you can forward email sent to email addresses on your domain to any other Gmail account. A lot of people choose to forward it to a free gmail account and then setup gmail to be able to send email from their domain email. If accessing your email through Outlook is important to you, you would have to set up an email forwarder and then setup Outlook to download email from the email account you are forwarding the mail to. Wealthy Affiliate’s reasoning for this implementation is to to simplify the setting up of email. Also, since they got rid of the Plesk control panel they had to implement a way for you to setup email addresses for your domain. On the same note, you are not able to modify your MX settings to use another email hosting provider such as Zoho. Update: While the above paragraph still remains true in 2017, I’ve been informed by the owners that they will be implementing the ability for Wealthy Affiliate members to configure and use MX and CNAME DNS records. A lot of Wealthy Affiliate members tend to have a lot of negative reviews about other internet marketing training courses on their websites, myself included. I don’t have an issue with the negative reviews, but sometimes I think the reviews use the word “SCAM” a little too liberally. Now granted a lot of these training courses are complete overpriced crap that try to get people to buy a course by pressing emotional hot buttons, but in my books that doesn’t necessarily constitute a scam. Is the manner in which these courses are sold unethical? Probably. To me, “SCAM” is a pretty strong word to be slinging around casually in reference to other internet training courses. I think there are better and more accurate ways to describe low-quality internet marketing training courses unless they truly are a scam. 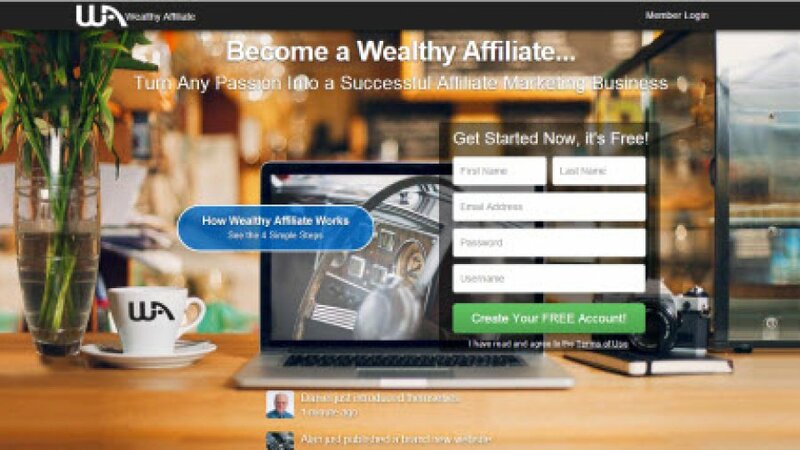 Wealthy Affiliate is primarily focused on teaching people how to build and market websites online in order to get the websites to generate revenue. Their website technology of choice is WordPress. A lot of the training in Wealthy Affiliate is geared towards marketing, and not how to develop WordPress. If you are looking for training on how to make modifications to a WordPress theme you are going to find it a little harder to get answers. With that being said, since so many members use WordPress and have used WordPress for many years there are a lot of people who are very knowledgeable about WordPress and that do help out other members when they encounter an issue with their website. You can also find some tutorials that will show you some basic WordPress development stuff such as how to transfer WordPress websites or how to setup a child theme to make modifications to a theme that will survive a theme update. We all have family and friends that get really passionate about sports and will defend their favorite sports team to the death. To them, their favorite team can do no wrong. I see the same thing happen with WA. A lot of people will get really upset and offended if you say anything negative about Wealthy Affiliate. I wouldn’t be surprised if I got some flack for writing this blog post. This is a downfall because blind allegiance can prevent people from seeing some of the drawbacks of a particular service or training program. I recognize that there are a lot of other quality internet marketing courses other than WA that do charge a lot more. However, just because they charge a high price doesn’t mean it’s a scam. If you look at the drawbacks I’ve listed above, you will see that most of them have to do with their hosting service and not about any other aspect of their membership. Furthermore these things are deliberate implementations designed to enhance security and performance. If you are brand new to internet marketing and have never created a website before, none of these issues are going to affect you. They only will affect you if you have previously built and created a website that you were looking to transfer to Wealthy Affiliate’s hosting. As far as the other “drawbacks”, I think those can be attributed to people just really loving what they have found in the Wealthy Affiliate community. The supportive Wealthy Affiliate community is a major reason I’ve been a member for almost 6 years. I’ve bought a lot of different types of internet marketing training and I’ve never come across anything else like Wealthy Affiliate. Sure other training that I have bought included access to a forum and I’ve heard of other training using Facebook and Google Hangouts to build a community, but I’ve never seen the level of interaction between members in other training than I have seen with the Wealthy Affiliate community. Everything has it’s tradeoffs. While Wealthy Affiliate has some aspects that I don’t like, I still think it’s one of the best places if not the best place to learn about Internet Marketing when you are first starting out. Read my latest up to date Wealthy Affiliate review to find out what’s changed since this review. I like your review Thomas and really appreciate it. You are very honest and look at the program from a perspective I’ve never though about before. But I do agree with you that Wealthy Affiliate is not perfect and there is no perfect program out there. Anyway compared to many other programs, WA is really one of the best programs if not the best one. The best part of WA is that you have 24/7 support and it’s EXTREMELY important when it comes to internet marketing. And especially, what I like the most about WA is that you can contact Kyle, the founder and get support directly from him. And this is exactly what I have done many times and can vouch for Kyle’s being very responsive and helpful. Hi Rufat, thank you for taking the time to comment. Yes, the 24/7 support is great. It’s nice being able to post a question or jump into live chat for help when you need it. I also have reached out to Kyle and found him to be responsive as well. I also agree that WA also is one of the best programs I’ve come across when it comes to internet marketing. Nice review! I appreciate your level of detail, and your candor. Like yourself, I’m a veteran trying to make it big online. Your about page didn’t have recent information, so, if I might ask such a personal question, how have your results been? Are you able to make a full-time income from your online endeavors? I’m just starting out, but my goal is to eventually get a 6-figure income from various websites. Baby steps for now though! Hi Andrew, sorry for the late reply. To answer your questions, no I am not making a full-time income from my online endeavors. I believe the biggest factor is due to my sporadic efforts. I don’t work on my websites consistently. I think if I worked(work) on my websites consistently I would be making more money than I am currently making which usually bounces between $50 – $100/month. Previous: Is Empower Network Legal?